Taper Lock Credit Union and Architect/General Contractor Ancon Construction broke ground last week on a new 2 story, 5,000 sqft building project in Mishawaka. Project Manager Doug VonGunten and Field Superintendent Tony Black will oversee the project which is estimated to be complete in October. The new credit union responds to the “new age” of banking design. The business center and lobby is based on the dialogue banking concept – following the examples of new retail and hospitality environments. A teller line is replaced with pods or stations which allow for a relaxed, welcoming setting. Furthermore, customer service is improved through a more transparent interaction between tellers and customers. A two story lobby with elevated display nook, stone feature wall, and soft seating will make the space feel like a living room. Other programmatic spaces include offices, staff lounge, support spaces, and work rooms. The second floor will feature executive offices and conference room overlooking the lobby below. 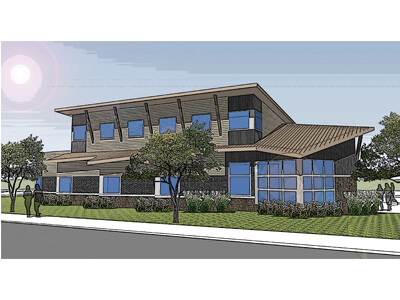 The contemporary architectural theme will be featured on the exterior of the building with cultured stone, brick, cedar beams, and two variations of architectural metal. “Ancon has been very responsive to our needs and wants for our new main office. Their ideas and concerns are much more than I expected. They have gone above and beyond in the planning of our new endeavor,” states CEO/President Jonette Thomson.